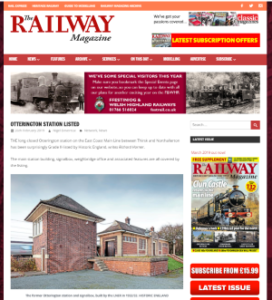 The Railway Magazine has detailed the listing of the long-closed Otterington station on the East Coast Main Line, between Thirsk and Northallerton, which has been Grade II listed. The main station building, signalbox, weighbridge office and associated features are all covered by the listing. The original station, opened on March 31, 1841, was demolished and replaced in 1932/33 by the London & North Eastern Railway (LNER) when the main lines between York and Darlington were quadrupled as part of a modernisation scheme. At the same time, a new signalbox (to a LNER Type 12 design) was built to control the then state-of-the-art colour light signalling along a four-and-a-half mile stretch of this section of the ECML. … This was part of LNER’s rivalry with the London Midland Scottish Railway in providing ever faster rail services between London and Scotland. The design of the buildings displays a 1930s streamlined aesthetic that was widely used at the time to promote a sense of modernity and speed. Perhaps in deference to more conservative architectural tastes of this part of rural North Yorkshire, the design was carefully moderated with neo-Georgian detailing. The 1930s modernity of Otterington Railway Station however never changed the fact that this was always a sleepy, little-used wayside railway station. It closed to passengers in 1958 and to goods traffic in 1964. Its remarkable survival is owed to its passing into sympathetic private ownership.